A former cement works in County Durham is to be the site of the UK's first "hot rocks" village. 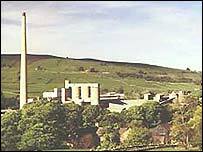 The Blue Circle cement works at Eastgate, near Stanhope, closed in 2002 with the loss of 147 jobs. A task force set up after the closure opted to search for natural hot water deep below the site. More than three months after drilling began, experts have revealed enough geothermal energy has been found to make the project viable. A team began drilling in September, boring 1,000 metres below the Weardale hills. A spokesman for the Weardale Task Force said: "The results of the drilling have established that there is a viable source of hot water on the site. "This news allows the final stages of the Eastgate site to be developed into the UK's first renewable energy model village incorporating geothermal energy." Demolition of the cement works site will begin in the New Year. About 150 jobs will be created initially, with more being generated when the complex is completed. More than £500,000 of public money has been spent on the test drilling project. John Hamilton, chairman of the Weardale Task Force, said: "The success of this project is largely due to the preliminary work carried out by staff from the University of Newcastle, who identified the exact spot for the drilling. "The hot water from the site will be used for heating and power generation. "This could make Weardale the first truly sustainable community in the British Isles. John Holmes, One NorthEast director of regeneration and tourism, said: "The results of the test drilling are very encouraging and will help drive plans forward for the site to eventually house the UK's first renewable energy model village. "This pioneering development has the potential to generate new jobs and prosperity for the dale and put the area at the forefront of renewable energy usage in the UK, which will play an increasingly important part in all our lives in years to come." Draft plans for the site include housing, leisure tourism and high technology business developments. A hotel and craft shops are also planned alongside the River Wear.